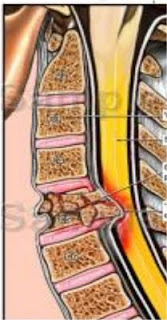 A spinal cord injury at the neck level with subsequent tetraplegia causes a dramatic change of live for the individual as well as for her/his family and friends. Tremendous efforts are put into research that would eventually cure a severely damaged spinal cord and increase the functional capacity of arms and legs. We are, however, not there yet and a more realistic approach than finding the ultimate cure for spinal cord injured patient, and to improve independence of a large proportion of the paralyzed population in a more expedient time frame, is to make existing treatment options to provide partial functional recovery available for the majority of the individuals living with tetraplegia. It is important to stress that the ultimate goal is to “cure” paralysis, and to emphasize that treatments leading to incremental functional recovery by no means take away from that goal but rather may offer a more practical, efficient and relatively quick path towards it. An injury to the upper part of the spinal cord may leave an individual with very limited or no movement or sensation in both the arms and the legs (tetraplegia). A surgical technique called “tendon transfer” can help restore function to arms and hands by giving working muscles different and new functions. This can greatly enhance the quality of life for people with tetraplegia by enabling them to do many more activities of their daily lives. Tendon transfer surgeries that can be performed depend on the level of the spinal cord injury, which muscles are affected and which muscles are still functioning. 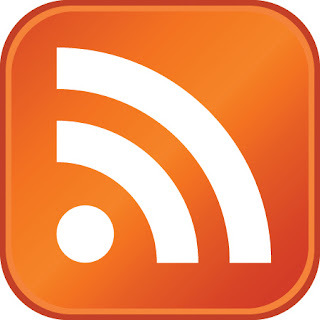 This movie clip demonstrates a person with tetraplegia who is driving his wheelchair uphill. He is powering the driving wheels using surgically reconstructed triceps. Finally, it cannot be stressed enough that the success of surgery is very much depending on the team effort of a highly motivated patient, skilled surgeons with interest in the field of tetraplegia and a team of dedicated experts responsible for rehabilitation and care. 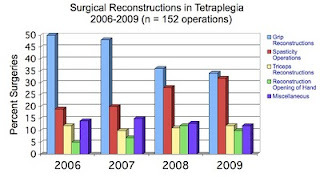 Bar graph demonstrating number and type of reconstructive hand surgery performed in our unit years 2006 through 2009. Note the relatively large and growing number of operations for correction of spasticity-related deformities (red bar).